Everybody likes to breathe clean air, stay healthy, and save money. Your heating/cooling system has the ability to deliver all three. When you keep your HVAC system tuned and clean as a whistle, its components not only last longer, it consumes less energy and keeps your living spaces clean and clear. In a way, your HVAC system is foundational to your health and a large part of your finances. However, it functions out of sight and therefore out of mind for many people. It also wears down gradually, which can make it difficult to spot issues until they get expensive and inconvenient. Keeping wear and tear at bay is easier when you have experts checking on your system and making sure it’s clean. At DUCTZ, we work hard to be close allies to both residential and commercial clients by fighting the contaminants that not only wear the systems down but also impact the health of anyone exposed to them. We’ve maxed out our service offerings and quality levels to make sure we’re the best air duct cleaning team in Palm Beach and beyond. But just what makes a great duct cleaning service? 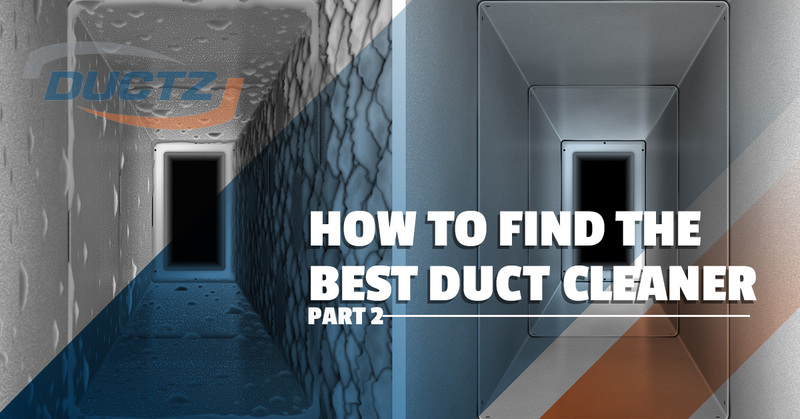 In our last blog, we explored a few points to explore with prospective duct cleaners. By doing a little investigating up front, you can assure the quality of the services you’re paying for. Check out a few more questions you may want to pose when searching for an air duct cleaning service. What exactly does your cleaning process include? When a company advertises “duct cleaning,” you can’t just assume they’ll give your system the cleaning it requires. Instead, take the time to figure out what they mean. All air circulation systems have supply and return branches as well as supply and return trunks. They should all be cleaned. Ultimately, all the components of your air systems are connected in one way or another, and if even one section is neglected, it can affect everything else. How will you clean the blower and the blower compartment? All the air that runs through your system has to go through the blower. If the blower and its compartment are dusty and dirty, it doesn’t matter how well the ducts get cleaned; the blower will contaminate them all over again. A great duct specialist will remove the blower and clean it. Once the blower is out, the specialist will have access to the compartment, at which point, the specialist should clean it out. Doing so not only ensure the results of your duct cleaning will last, it prevents cross-contamination and ensures you’ll truly be able to breathe easy. Will you clean the A/C drain pan and coil? This is Florida, which means our air conditioners have to be ready to work hard all year long. When you get your ducts cleaned, your air conditioner should always get attention. Otherwise, it will spread dirt and other contaminants around your cleaned system the instant you turn it on. Not only that, a dirty air conditioner wears out faster and guzzles more electricity. Instead of letting that happen, contact DUCTZ. We will clean your air ducts and your air conditioner so you can enjoy clean air and lower energy bills. If the idea of strangers working on your property makes you feel a little odd, you aren’t alone. What if they damage your property? What if they get hurt? We all hope that nothing goes wrong, but it’s important to have safety measures in place. A good duct cleaning team will protect themselves and your property by investing in Liability Insurance and Workman’s Comp Insurance. The company you choose should be able to show you proof that their policies are current. If they cannot, it’s time to choose another company, no matter how great their prices may be. You should feel confident in the company you choose. However, it can be difficult to find the truth in piles of sales copy. The good news is, testimonials usually cut through the razzle-dazzle. Duct cleaners who are on top of their games will have lists of clients willing to give them references, whether through writing letters or being willing to talk to you on the phone. It never hurts to ask for references, if only to see how the company responds. If they seem reluctant to accommodate you or don’t have references to offer, it’s probably a good idea to consider another company. Florida’s moist, warm climate can lead to some pretty serious molds, pests, dust, and other issues within air ducts. Whether you own a business or a home, we are here to clear your HVAC system of all contaminants so you can take a deep breath and relax. Contact us to learn more!